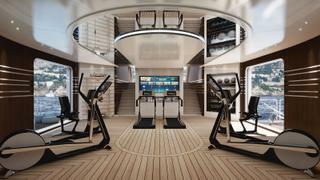 An on board gym featuring Technogym equipment. All images courtesy of Gym Marine. When looking for gym equipment for your superyacht, from treadmills to elliptical machines to weights, it would be hard to find a more prestigious brand with which to kit out your wellness centre than Technogym. The company has been the official fitness equipment supplier at the past seven editions of the Olympic and Paralympic Games, from Sydney 2000 to PyeongChang 2018, keeping the fittest athletes in the world on top form. Long before “wellness” became a lifestyle buzzword, Technogym was honing its signature approach, using state-of-the-art technology to make first-class machines and developing a Wellness Connected System that allows users to access their personal plans from any equipment anywhere in the world. Whether you want to lose weight or improve your strength, you are a beginner or a professional, want to do cardio, stretching or strength training, there is a Technogym product for you. And as well as functionality there is a focus on form: the Personal Line is elegantly contemporary and is available in a variety of designs to suit any residential or superyacht interior. Personal Line is an iconic range because of the way it interprets the combination of Technogym’s 30-year experience, and the design concepts of world-renowned architect and designer Antonio Citterio. The Italian has created a unique line of equipment inspired by nature and science. It also does so with style, thanks to Citterio’s use of refined materials and top-level craftsmanship. It comprises five pieces in polished aluminium, from a cross-trainer to a treadmill. 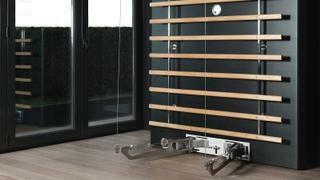 The undisputed star of the collection is the Kinesis Personal, which incorporates 200 exercise possibilities into less than one square metre of space. The free cable system station uses the latest Full Gravity technology to allow you to improve your strength, flexibility and balance through exercises that involve co-ordinated movements based on resistance techniques. It is also an attractive addition to your private gym, available in Heritage Black, which features wooden support bars, or Vision, made of three steel panels that create a mirror effect. Heritage Black is available in black treated wood with a special permanent varnish or hand-applied leather. There is also Recline, an exercise bike that has already won an award, having received 2012’s “Best of the Best” Red Dot Design Award in the product category. Designed by Citterio, it features an innovative ergonomic seat and backrest for support and comfort. Other pieces in the collection include the Cross Personal, Run Personal and Power Personal. The Cross Personal can be used by multiple skill levels, is silent in its mechanism, and has built-in surround sound. Meanwhile the Run Personal, the brand’s new state-of-the-art treadmill, features an in-built Unity screen offering a range of entertainment options. Lastly, the Power Personal is a weight rack and bench for weightlifting; the sturdy design, precision glide and advanced lock systems ensure you’ll avoid any potential unwanted injuries. 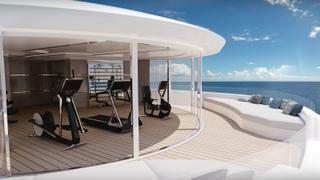 For its unique design, technology and style, make Technogym your first choice for your superyacht gym.